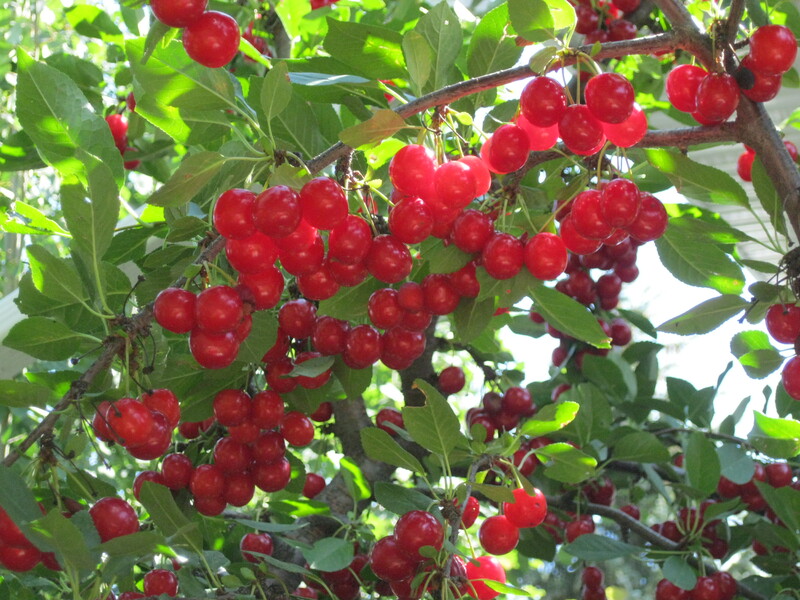 The sour cherry season is upon us, quite early this year because of the warmer than usual weather we’ve had. 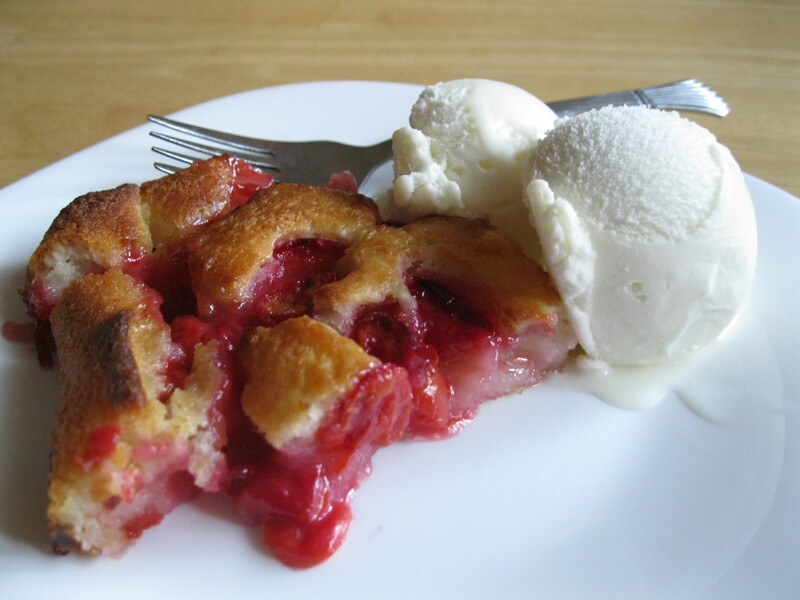 This is a delicious way to use up some of the bounty, Sour Cherry Cobbler. Please read the recipe through before starting, there are three little steps–the butter, the batter, and the cherries. It’ll be much quicker if you know the procedure before you begin. Depending on the sweetness (or sourness) of your cherries, you can probably quite safely reduce the first quantity of sugar from 1 cup to 3/4 cup, without sacrificing any quality of taste or texture. Although it’s best served warm on the day of baking, it is still very good the next day. Preheat oven to 350° F. Lightly spray the sides of a 9″x13″ cake pan with cooking spray. Add butter to the pan and put in the preheated oven to melt completely. Meanwhile, in a mixing bowl, stir together 1 cup flour, 1 cup sugar and baking powder. Add milk and almond flavoring and stir to combine all ingredients. Remove pan from oven. Carefully pour batter evenly over the melted butter. Do not stir! 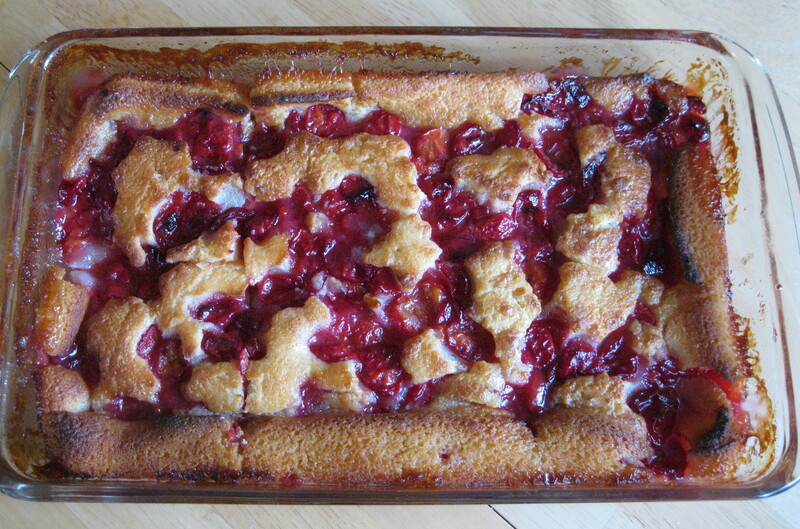 Toss pitted cherries with 3/4 cup sugar and 1 tbsp flour. Carefully dot the cherries over the batter. Return pan to oven and bake for about 50 minutes until golden brown and a toothpick inserted in the cake comes clean. Allow to cool 10 minutes, then serve warm with ice cream or whipped cream or vanilla yogurt.